I'm really not sure why this dish exceeded my expectations. If you start with fresh, local, seasonal ingredients you invariably come up with delicious foods with little effort. 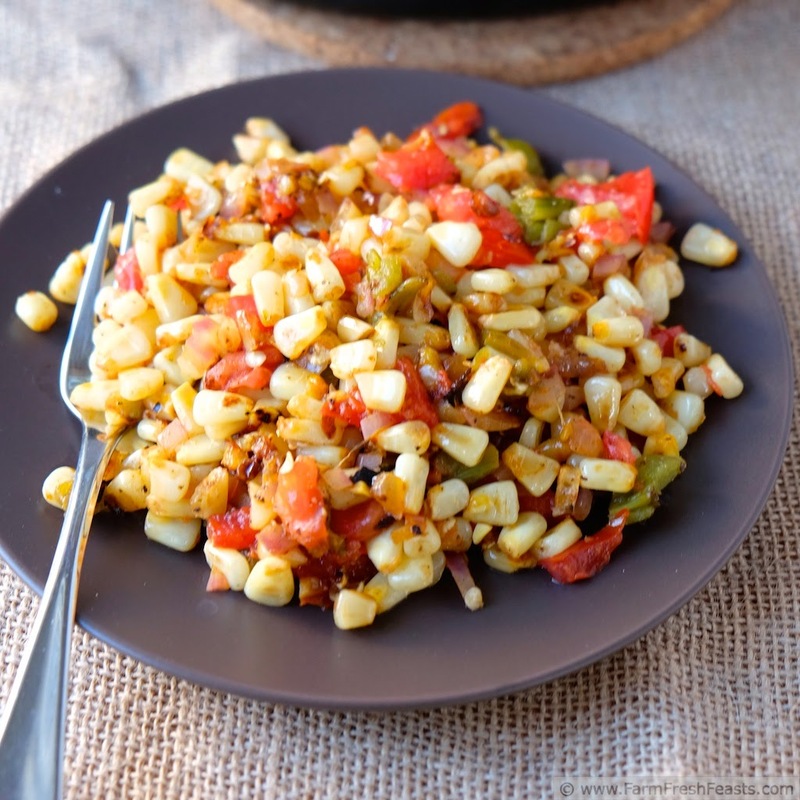 One example is this colorful side of freshly sautéed corn kernels spiced up with roasted Hatch chiles. I was so busy with the social media sharing aspect of #IceCreamWeek [have you entered? the giveaway ends 31 August. One winner takes ALL. Enter here!] that I had very little mental energy for thinking up new and interesting ways to cook the veggies in our farm share. 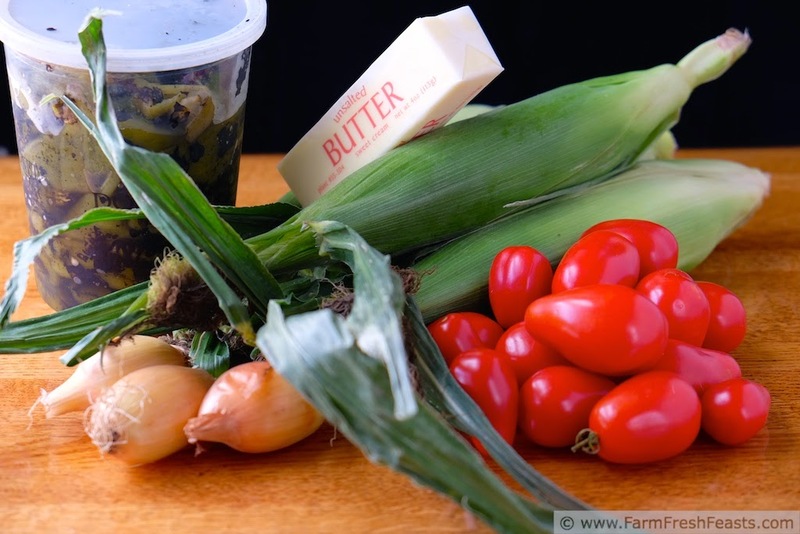 But it's summer, and as this typical late summer Community Supported Agriculture (CSA) farm share box shows--these veggies are pretty easy to use! I simply grabbed a few things out of the fridge and got going. I had a tomato that needed to be used NOW, so I tossed that in for color. It was fast, it was easy, and it was tasty. We had the first batch for dinner, with fried eggs alongside since I keep forgetting to thaw some of the ground beef in the freezer (link to 106 recipes using ground beef, if you remember to thaw it in time). I ate the leftovers with a scoop of feta cheese stirred in, and my daughter ate hers with leftover Asian chicken and rice. I made it again for lunch with friends with the feta as a topping. Yum! It's a versatile dish to be sure. 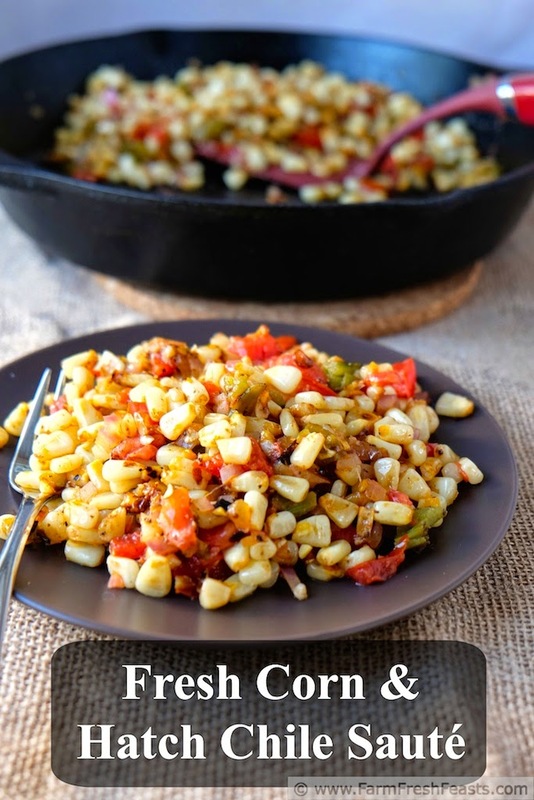 Although I'll categorize this as a quick side dish that would easily adapt for vegans (substitute olive oil or vegan buttery spread) I also liked eating it, with a bit of feta or an egg, or both, as a meal. We liked this with 2 chiles, and most of their seeds, but if you want it hotter add another one, if you prefer more mild take one away. In a large skillet over medium heat, melt butter. 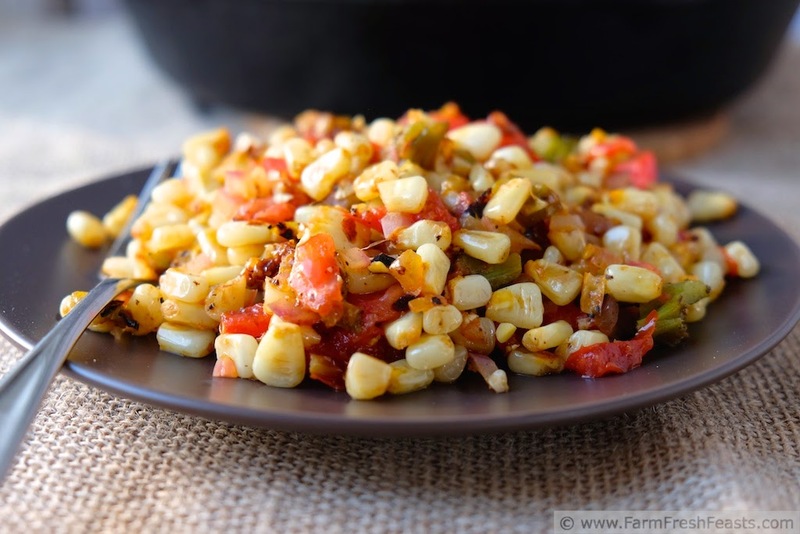 Add corn and stir to coat with fat. Sauté for 5 minutes until corn begins to become tender, then add the rest of the vegetables and sauté for another 5 to 8 minutes until everything is heated through. Taste, then toss in the herbs and season with some salt and pepper. Taste again until you like what you get. Serve--with or without a spoonful of feta stirred in and topped with a fried egg. Or use this to top a vegetarian pizza--recipe here. This looks fantastic! The combination of the chilies with the fried egg sounds delicious. Thanks, Kirsten! Love this - so (reasonably) quick and easy! Shared, Stumbled & Pinned! P.S. - You knew that I'm a Dayton girl from way back, right? This combination is screaming summer. I really want to make this - I could see it as the base of so many delicious dishes. I just got a batch of hatch chiles in the mail!! I'm just *slightly* excited... :) I'll have to try this one soon! 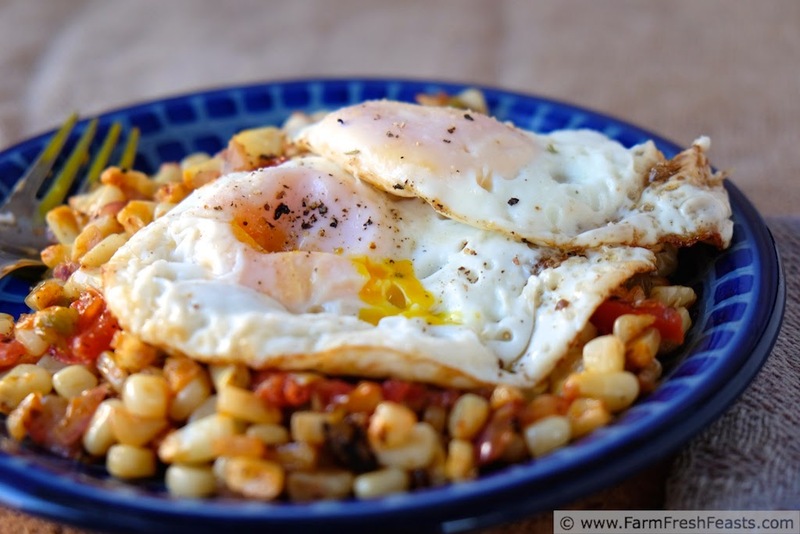 This is a great idea - I especially like putting the fried eggs on top, thanks for the inspiration! I wish I had a great source for fresh Hatch chiles. I love this idea, especially with an egg on it. Now this sounds absolutely delicious. You already know I've got chilis, and I still have corn too. It's actually cooked in fact and hanging out in the fridge just waiting for me to read this post. I knew there was a reason I was backed up on Farm Fresh Feasts. It was meant to be.